The HANDfuls meet on a rotating schedule: October 2 and November 13, 2018; and January 22, February 19, March 26, and May 21, 2019. Meeting format is a brief Show and Tell followed by a demo or project that we can work on throughout the morning, at home, or on the road. Everyone is welcome to join us as a participant or an observer. You don't have to sign up or attend every month. Drop ins are encouraged. 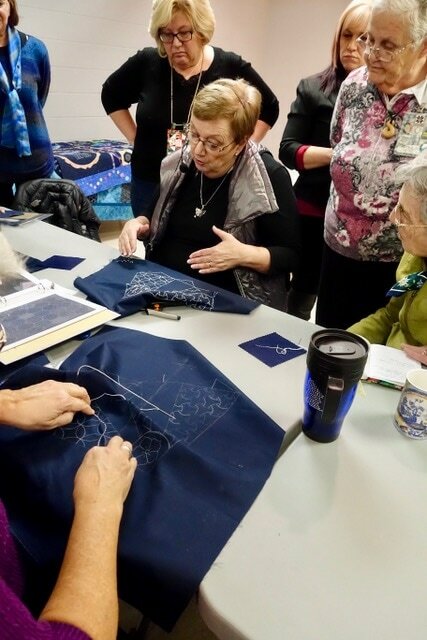 A large and busy group: lots of Show and Tell and a first look at the wool appliqué project for the 2019 quilt show. 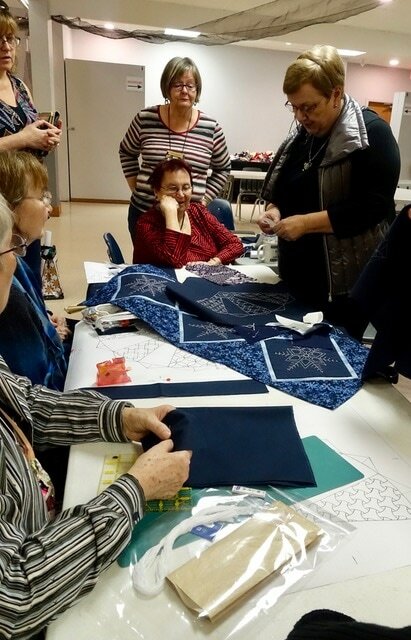 Thanks to Sylvia for organizing our first project of the year -- a lavender sachet. Here we are hard at work. 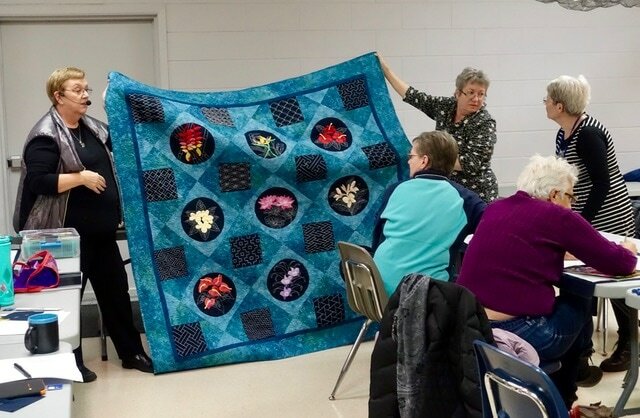 Thanks to Joanne for her demo on constructing the crazy quilt foundation hexagons. We will be embellishing these at the February meeting. 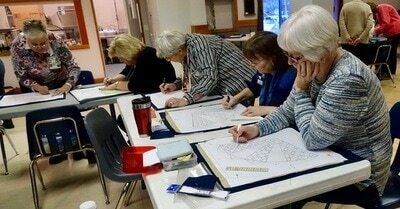 Not too late to join in -- see Joanne for instructions. Great to see so many beautiful bags from the November demo, some finished, some still works in progress. 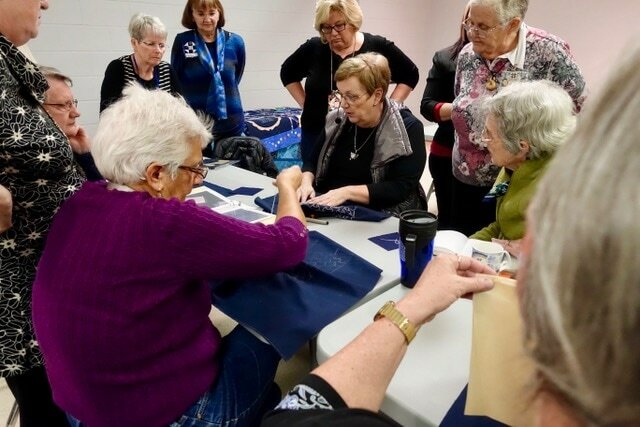 Our first gathering of hand sewing enthusiasts attracted 14 participants, all looking for inspiration, advice, a chance to practice their skills, and an opportunity learn new techniques. Our little Show and Tell was a fine demonstration of the talent in our midst, and clearly there is lots to be learned from one another. Since we are a group of people who like to travel, many expressed an interest in portable projects to take on vacation or to work at during guild meetings or in front of the television. 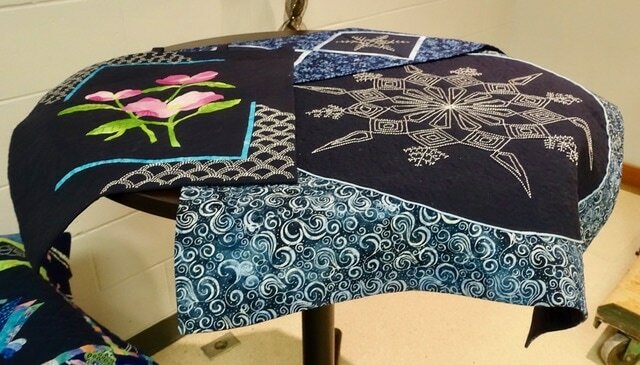 Among the suggestions: hand embroidery, hexagons (both plain and embellished), beading, sashiko, pojagi. And we do need to come up with a name for this group...any ideas?? Format for future meetings will be a brief Show and Tell at 9:30 a.m., followed by a demo or project that we can work on throughout the morning, at home, or on the road. 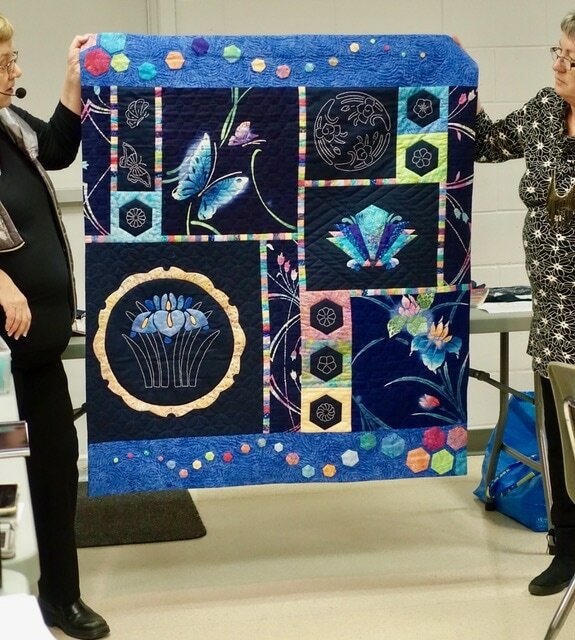 October 14 -- Joanne Tjaden will introduce us to some embroidery stitches and needles, and get us started on a reference sampler. If you wish, bring along a strip of muslin or other background fabric about 5" x 12", embroidery needles and floss. Don't worry if you don't have these -- there will be lots to share. November 11 -- Hexagons Demystified, including how to cut them quickly from Jelly Rolls.